A production worn Auditor appliance, signed by actor and writer/director Gary J. 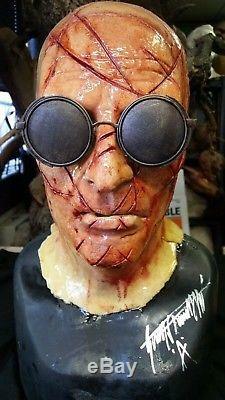 This unique piece is screen used and was carefully removed after filming, mounted on a custom bust, and preserved with UV protective urethane. 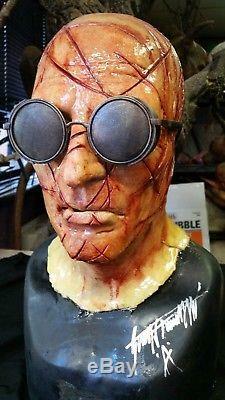 One of very few preserved Auditor appliances, this bust provides an excellent look at a unique new character in the evolving Hellraiser universe. Its look is completed with a set of The Auditor's custom made sunglasses. The lot includes a letter of authenticity signed by writer/director Gary J. 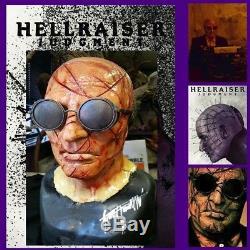 The item "Hellraiser Judgment screen used Auditor mask Pinhead Lament box Clive Barker" is in sale since Friday, November 16, 2018. This item is in the category "Entertainment Memorabilia\Movie Memorabilia\Props\Originals". The seller is "bloodbayouwwe" and is located in Burbank, California. This item can be shipped worldwide.